"You're a Grand Old Flag" is a patriotic song of the United States. The idea for this Cohan favorite came from an encounter he had with a ﻿Civil﻿ ﻿War﻿ veteran who fought at the battle of ﻿Gettysburg﻿. The two men found themselves next to each other and Cohan noticed the vet held a carefully folded but ragged old flag. The man turned to Cohan and said, "She's a grand old rag." Cohan thought it was a great line and respectfully changed the word 'rag' to 'flag'. Cohan's song is a spirited march and a tribute to the U.S. flag. It makes references to our flag, and it uses snippets of other popular songs. Cohan wrote it in 1906 for his stage musical, George Washington, Jr. After its preview in the musical, it became the first song in American history to sell over one million copies of sheet music. 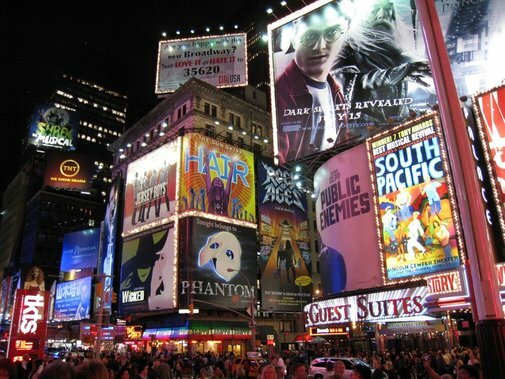 Listening Example: "Give My Regards to Broadway"
George Michael Cohan, was an American entertainer, playwrite, composer, lyricist, actor, singer, dancer, and producer. 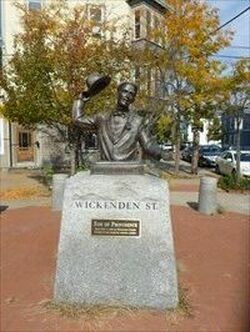 Cohan was born on July 3, 1878 in Providence, Rhode Island. George and his whole family told everyone that he was born on the 4th of July; however, there is a baptismal certificate from the Irish catholic church where he was baptized that says his birthdate is July 3. George’s parents were traveling vaudeville performers and he joined them on stage as an infant as a prop! As soon as he could walk and talk, his parents taught him to sing and dance so he could perform with them. Listening Example: "I'm a Yankee Doodle Dandy"
As a child, George Cohan was somewhat temperamental, but he later learned to control his frustrations. He began his career at age 8 playing violin and dancing. 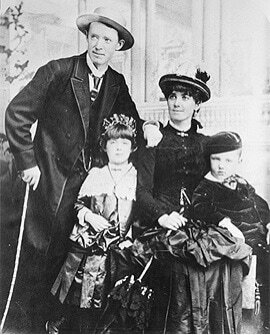 Cohan performed with his parents and his older sister Josie in a ﻿vaudeville﻿ act known as "The Four Cohans." He joined them on stage while still an infant, first as a prop, then learning to dance and sing soon after he could walk and talk. George began writing original skits and songs for the family to perform. "The Yankee Doodle Boy" is a song most people know as "I'm a Yankee Doodle Dandy". It is a patriotic song from Cohan’s first Broadway musical in 1904. Cohan used snippets of popular American songs in the lyrics, as he often did with his songs. In the show, Yankee Doodle Dandy was the name of a racehorse. The 1942 film Yankee Doodle Dandy was a tribute to Cohan’s life and music. The part of Cohan was played by famous actor James Cagney, who was a fine tap dancer. 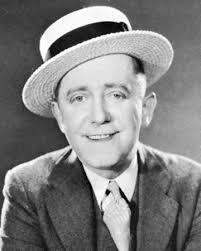 Cagney had a charisma that brought energy and life to Cohan’s music, and brought smiles and laughter to peoples’ faces. Frameworks: M.1.4., M.5.1., M.5.2., M.5.5. ﻿Vaudeville - a theatrical variety show with no plot or theme; singers, dancers, acrobats, jugglers, etc. 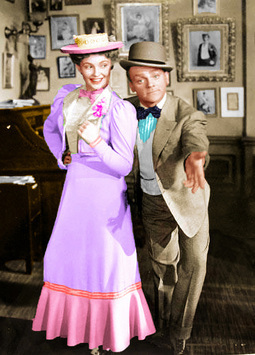 James Cagney in "I'm a Yankee Doodle Dandy"
The Cohan family takes a bow. In 1917, George Cohan became one of the founding members of ASCAP, the American Society of Composers, Authors, and Publishers. This is the arts organization that protects copyrights of artists. He appeared in films until the 1930s, and continued to perform until 1940. 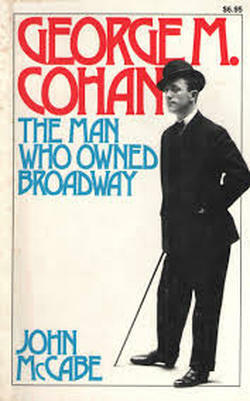 Before World War I, Cohan was known as "the man who owned Broadway". From 1904 to 1920, Cohan created and produced over fifty musicals, plays and revues on Broadway including Give My Regards to Broadway. His shows ran simultaneously in as many as five theatres. His life and music were depicted in the 1968 musical George M!. A postage stamp and an 8-foot bronze statue of Cohan in Times Square, New York City commemorates his contributions to American musical theatre. In his shows he uses dance not merely as razzle-dazzle, but to advance the plot. Cohan's main characters were "average Joes and Janes" that appealed to a wide American audience. "Give My Regards to Broadway" is a song written by Cohan for his musical play Little Johnny Jones, which opened in 1904 in a Broadway theater. Cohan, playing the title character, sings this sentimental song as his friend is about to sail to America from England. It's common for performers to sing this song with a top hat and a cane, to represent the theaters of Broadway. George Cohan was an early founding member. This is the time of year when adults prepare their income tax returns, and George Cohan won recognition by having a tax rule named after him. In 1930, Cohan won a law case against the Internal Revenue Service that allowed the deduction, for federal income tax purposes, of his business travel and entertainment expenses, even though he was not able to document them with certainty. This became known as the "Cohan rule" and is frequently cited in tax cases. As a child, Cohan and his family performed in vaudeville theaters most of the year and spent summer vacations at his grandmother's home, where he was able to spend time with other kids riding a bike and playing baseball. Cohan's memories of those happy summers inspired the musical 50 Miles from Boston, which contains one of his most famous songs, “Harrigan". In “Harrigan”, Cohan both celebrates and mocks his Irish heritage. The song has been adapted for use in political campaigns, including that of President John F. Kennedy, who was also of Irish heritage. George Cohan won a case against the IRS which led to the "Cohan Rule" regarding deductions for travel expenses without documentation. Massachusetts where Cohan and his family performed during summer vacations. George Cohan as a youth. George Cohan was called "the greatest single figure the American theatre ever produced – as a player, playwright, actor, composer and producer." In 1936, President Franklin Delano Roosevelt presented him with the Congressional Gold Medal for his contributions to World War I soldier morale, in particular the songs "You're a Grand Old Flag" and "Over There.” Cohan was the first person in any artistic field selected for this honor, which previously had gone only to military and political leaders, philanthropists, scientists, inventors, and explorers. 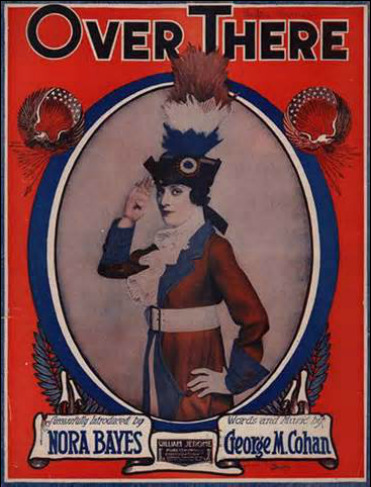 Cohan wrote the World War I song "Over There" in 1917. "Over There" was popular with United States soldiers in both world wars. It was a song designed to encourage American young men to enlist in the army. Cagney was recognized for his efforts to entertain war troops overseas. Youtube Video - "Over There" performed by James Cagney and Joan Leslie in a scene where they are entertaining troops during WWI.